> Mobile Health (mHealth)- using any mobile communications device, including smartphones and tablets, along with hundreds of software applications to support healthcare. 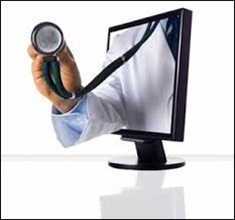 Telemedicine programs have evolved to support specific disease conditions such as diabetes and congestive heart failure. Target populations include geriatric and pediatric patients. Specialties have emerged in areas such as tele-psychiatry, tele-pathology, tele-dermatology, tele-ophthalmology and my personal favorite, teleradiology. By my count, there are over 120 commercial telemedicine/telehealth providers and close to another 100 teleradiology companies. Several firms have raised tens of millions of dollars to develop and promote their services (Amwell, Teledoc, MDLive). Most of these target insurance companies who now offer telemedicine to their clients and recent data shows that 70% of larger employers offering telehealth as a benefit (although utilization remains low). Telemedicine has been shown to provide great clinical benefits to under-served populations (third world countries and rural areas) but economic justification remains elusive. Many hospitals now offer telemedicine services with a major focus on reducing hospital re-admission to avoid Medicare penalties. Most hospitals use a teleradiology company to cover overnight shifts, but that trend has shifted somewhat as radiology groups are reorganizing to capture lost revenue. Barriers to telemedicine acceptance exist including those of regulation and reimbursement but through lobbying and educational efforts, those are finally changing (as now a majority of states have parity laws for the reimbursement of telemedicine). Medicare remains a stubborn hold out. The annual American Telemedicine Association meeting in 2017 had over 6000 attendees.